This article may be Overly Irish. The British may understand humour, but frankly we couldn't care less. Don't change a thing to remedy this. For those without comedic tastes, the so-called experts at Wikipedia have an article about Ryan Tubridy. Ryan Tubridy (gender:male) is an Irish-Iranian-Icelandic-Indian radio and television presenter for RTÉ and general (t)wit of the genus Montrosus, usually found when any Irish TV, radio or housewife is turned on. Affectionately known as the "Streak of Misery" (or "The Twig", a name coined by former President of Ireland Dustin the Turkey), Ryan is an accomplished (s)talker, winker and nudger and has even won the coveted Rose of Tralee trophy on a number of occasions. He now hosts Ireland's number one live televised farce, The Lite Lite Show, after threatening to eat if he wasn't given the job. His loyal secret police force, the Ryan Tubridy Resistance Corps, saw off previous host Pat Kenny and other possible candidates such as Gerry Ryan and Linda Martin, and installed Commander Tubridy in the hotseat. Ryan's time as host has seen him perfect his developing talent for hand-to-desk-slapping, an act for which he now holds two gold stars and several million silver medallions. Tubridy rose to fame after Irish grandmothers discovered that he was infact "lovely", wore "lovely jumpers" and "sure isn't he so cute I could eat him up" before revising this statement and acknowledging that there isn't very much of him to eat anyway. Orphaned from birth, Gerry Ryan served as his surrogate mother after finding Tubridy in a suitcase under a sink in the RTÉ canteen. After he split with his wife, Tubridy engaged in a brief sexual relationship with a cardboard cut-out of fellow RTÉ presenter Miriam O'Callaghan. It objected to having such a thin partner and flapped off in disgust to begin a more successful fling with a cardboard cut-out of Tesco underwear model Brad Pitt. Ryan has seventeen daughters who live in four different countries on three continents, though half of them are not actually his. Ryan claims to have read more than 55 million books and can use big, long, complicated words like pseudopseudohypoparathyroidism with ease. His great ambition is to achieve the Guinness World Record for reading War and Peace the most times in one life - he is halfway there. A child prodigy, Ryan was able to read from the age of one, was visible on TV from the age of twelve and, under the guidance and tutelage of wise old man Gay Byrne, was able to hone his broadcasting skills handsomely at that tender mid-pubescent age. Indeed Ryan is believed to be the only person to have learnt the secret smirk, wise old man Byrne's greatest weapon against the not having a shite in a pigsty notion what someone vague and dull from early morning British television was talking about. Despite having the voicebox for radio Ryan was soon working his way around RTÉ lapping up opportunities to talk, be listened to and looked at simultaneously. RTÉ darling Gerry Ryan adopted him as some sort of surrogate son without explaining how this procedure actually worked. Ryan was enslaved by mother Ryan and forced to make tea for several years before making his escape through an air vent one April morning when an unidentified gas cloud knocked out Gerry's entire production team, though Gerry himself survived. Ryan was eventually given his own chat show, Tubridy Tonight, an hour long infomercial for books, CDs, novels, books and cosmetic surgery - oh, and novels. Did I say books? Some brainy bird with a long name whom he kidnapped from the 2005 Rose of Tralee. In 2008, Pat Kenny's ego announced that Pat Kenny was stepping down as host of long-running TV farce The Lite Lite Show when the current run ended in 2009. However, as he wished for a part of him to remain in the hot seat, he accordingly gave birth to Tubridy's nose through parthenogenesis and unanimously installed Tubridy as the new host of The Lite Lite Show. 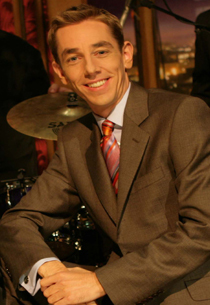 Tubridy, wishing to increase the 99.4% Tubridyness of the position of The Lite Lite Show host (with the remaining 0.6% consisting of Kennyness and concentrated entirely in the nose), promptly adopted the US-style chat show format from his Saturday night show Tubridy Tonight and migrated the Cheddar Quartet from it. Apart from his obviously wooden nose, Tubridy has succeeded in making The Lite Lite Show nothing like the Pat Kenny version, although some elderly members of the audience have wondered whether Kenny will return and depose the man who is only 3/500 of the man Kenny was. 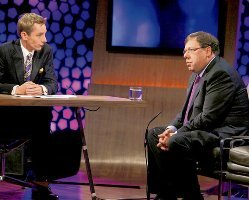 Tubridy's first time on The Lite Lite Show was on 4th September 2009, and his first guest was Taoiseach and romantic novelist Brian Cowen. During the course of the interview, in which Cowen used big words such as "fiscal" and "judiciary" much to the delight and physical arousal of the presenter, Tubridy proceeded to move ever closer to him before ripping Cowen's shirt open and molesting his ample chest. Tubridy then proceeded to wrestle the Taoiseach to the ground before RTÉ swiftly cut to a commercial break, followed by a re-run of cult children's TV crime drama Bosco. About 35 minutes later, The Lite Lite Show resumed as though nothing had happened, although Cowen was nowhere to be seen. Tubridy later dismissed the whole event, saying: "I don't know what came over me... That man has a way with words and I just couldn't help myself. The tipping point was when he said 'transubstantiation'. I nearly wet myself. That was that for me. I knew then I had to have him". Cowen himself said about the interview: "He gave me a right going over, as every decent interviewer should. I'm happy to be content to say that I said what I said which was that I was thoroughly satisfied with his performance". RTÉ defended Tubridy's behaviour and denied it had even happened, instead blaming an unrehearsed rampage by a Giant Panda which had escaped from Dublin Zoo. Sunday Independent journalist Jody Corcoran was incensed and leapt to the Taoiseach's defence with a full-frontal (page) spread as the controversy gained momentum throughout the weekend. RTÉ News's political arch-rival Ursula Halligan announced live on TV3 News that she had even interrupted a family holiday in Barbados to be there to cover the story. Tubridy was charged with Taoiseach molestation under the 1924 Molestation (Taoiseach) Act on 7th September 2010, but the case was dramatically thrown out as Cowen failed to turn up as the star prosecution witness as he was having a pedicure that day in preparation for his official tryst with the King of Finland, Paavo IV. Halligan was speechless, an event which made the headlines on that evening's edition of RTÉ Six One News 30 minutes later. Ryan's other highlight of his time on The Lite Lite Show was when Peter Kay picked him up and flinged him over his shoulder. RTÉ deleted all video evidence of this moment but it later resurfaced on YouTube and made it to number one on TV3's Top 10 Irish Comedy Television Golden Moments of the Year with Martin King, narrowly beating Pat Kenny on The Frontloin, Pat Kenny on The Frontloin and Pat Kenny on The Lite Lite Show. Tubridy met President of the United Arab Emirates Barack O'Bama inside a washing machine on 17th March 2010 in an undoubted highlight of his career as Ireland's leading expert on UAE politics. He hasn't stopped talking about it since. shaved his head to act as stand in for Patrick Stewart in Star Trek because the back of his head was better looking. was a conscientious objector during the attempts to increase his salary on the grounds of not being able to live on 3 mil a week. doesn't own a TV as the only thing he'd be bothered watching on tv is himself and his show is broadcast live. feared he'd lose his chat show because his ego wasn't big enough or at least not as big as Pat Kenny's. invented a new colour but pat Kenny proved it was really a type of sandwich filler using the awesome power of his degree of physics. Ryan was devastated. attempted to synthesize a personality but couldn't get Pat out of the RTE lab where he was cloning Gay Byrne's knees. is the son of Patleen Kenny who is the son of Gaybrius Byrne who is the son of Terry Wogan who is the son of Michael Parkinson's disease who is the founding father of encouraging famous people with huge egos to talk about themselves which is about as difficult as getting a pig to sniff shite. Wins you over with that "School Photo" smile. president of the international society for the advancement of ferret smuggling as an ok thing to do. once tried to give himself away in a hamper but was caught by customs on the way to a weekend break in Minsk. a few of his favourite things are licking stamps, being recognized on Grafton Street and fidelity. has never danced with the devil in the pale moonlight, but HAS been known to creep up to the homes of unsuspecting couples and peer in the top window to watch them "start ridin" at the stroke of 12 o'clock... in the afternoon. he wants to go to Mount Splashmore! Take him!-Take him!-Take him!-Take-him-now! was often confused with his first class teacher's meter stick, even though by then Tubridy was already 11 feet tall and 19 millimetres wide. He actually more closely resembled the Spire at that point really. Tubridy would return home covered in chalk, from a day of ruling the blackboard, and sometimes blood, from being used to strike his naughty classmates on the knuckles or maybe the bridge of their nose. has the utmost respect for Jan Koller. lived for 10 months on the burial site of an ancient, murky being known as Jeremy Kyle. has an unusual habit of refusing to allow lift doors to close fully; as a result, Tubridy can often be seen standing patiently in an open, motionless lift with his long narrow foot (measuring 34 yards) wedging the door open. A common RT quip at such times is, "Jayzers, it's a long aul' slog to the top floor, to be sure. lifelong ambition is to record a cover of "Ain't Misbehavin" as long as it is a duet with his favourite jazz singer, Martin McGuinness. "He sings like a freed hunger striker", said one man we found in a bin outside. This page was last edited on 10 September 2012, at 07:22.